Mindanao or “the land of promise” is the second largest island in the Philippines. It’s the only area of the Philippines where people of the different faiths are sharing their promise to develop sustainable peace for the new generation. During October 28-30, 2011, Peace Revolution participated in the Republic of the Philippines Department of Education’s* the 7th Peace Village Residential Experience (PVRE)**, Kalinaw-Kalilintad Integrated Peace School, The Peace Village, Kapatagan, Lanao del Norte. We were invited by the Ministry of Education in October 2011 to organize Inner Peace Time sessions with Filipino students in the Peace Villages. The program is taking the initiative to give school children of different backgrounds a chance to meet and happily co-exist through promoting the spirit of respect and understanding regardless of social and religious differences. 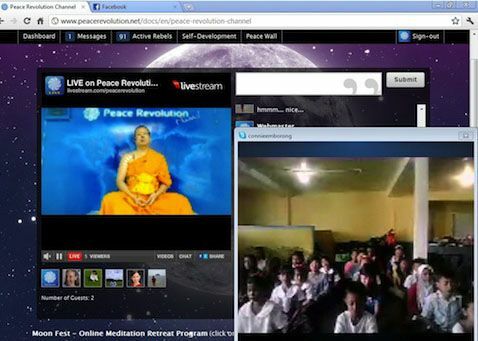 It aims to allow students and teachers in the education region X of the Philippines to experience peace through different kind of activities such as peace prayer, peace parade, peace concert, tree planting, workshop on non-violent communication and of course Inner Peace Time (IPT) using meditation. Our staff including a professional meditation instruction will participate in this activity by hosting a basic meditation for 500 Filipino teachers as well as 80 principals from the region at the Peace Village, Kapatagan, Lanao del Norte. Additionally, a presentation ‘meditation and its scientific benefits’, will be presented by a Filippino Peace Agent Connie Emborong. Connie, who completed the Peace Revolution Educator’s Fellowship in July 2011, is the coordinator of the PVRE, as well as, a division peace education coordinator for the Department of Education in the Philippines. Peace Agent Connie blazes forward, “Allow the fire of your heart to burn for peace. Peace starts with the children. (We can all) do little things that (we) know that can contribute to achieve peace, inner peace or world peace (we all play our little part)”. 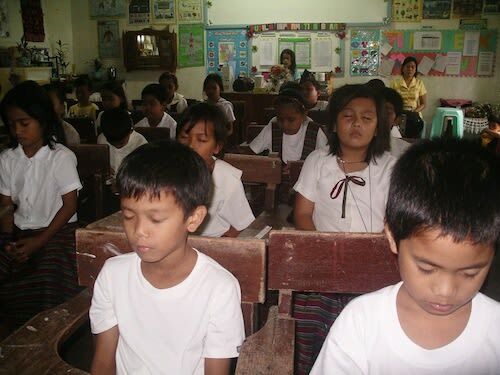 A guided meditation session for all 500 or more teacher participants from the whole region X. 2 This program is prepared by Peace Agent Connie Emborong who is an ESP-1/Division Peace Coordinator. It is under a supervision of MARIA LUISA B. MUTIA, Ed. D. CESO V, Schools Division Superintendent.